The air duct in your home moves the air throughout your house via your cooling or heating system. With time, it is normal the air duct to become contaminated with dust and mold. If someone from your family is sensitive or allergic to dust and mold, they could face health issues if the air duct is not cleaned regularly. Here are few simple tips on how to clean the air duct in your home. Assess For Mold – The mold is created in places where the moisture level is high, such as the air duct. This helps create a non-healthy indoor environment. Because the air goes through the air duct, mold particles are released into the air in your living space. The mold usually appears inside the air duct, or on other places in your cooling and heating system. If your insulated air duct develops mold, the best thing to do is to remove and to replace the damaged insulation. 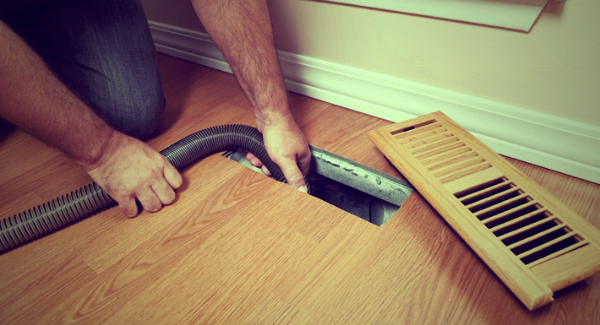 Check For Debris And Clogs – Also, the air duct can create clogs from debris and even from insects and rodents. If this happens, you may notice pieces of clogs flying into the air from the duct. The danger from such pieces blowing into your home comes from the possible mildew and mold that may be developed from collapsing organic matter. Hire A Cleaning Professional – Because the air duct system is quite extensive, it is generally a good idea to hire an experienced duct cleaner to perform appropriate cleaning. Supervise the whole process in order to find out what are the causes for the mold creation in your air duct. It is useful to make laboratory analysis before starting with mold removal. EPA Recommendations – Remember that when you clean the mold in the air duct or when replacing the moldy insulation, part of this process has to involve remedying the environment that allows mold to develop in the first place. If you do not fix these problems, then more mold will be created in your air duct. Selecting A Professional – Make a good research on the market in order to find reputable companies for air duct cleaning. Read testimonials from satisfied customers, and also check costumers complains about a certain company. Before you make a decision, make sure that the company that you plan to hire offers the best prices on the market.